Waunakee, WI - Feb. 11, 2019 – NORD Gear Corporation is unveiling the new MAXXDRIVE® XT series of industrial gear units at the Grain Elevator and Processing Society (GEAPS) Exchange, March 9-12, 2019 in New Orleans, LA. The MAXXDRIVE XT series expands NORD’s line of industrial gear unit (IGU) production. The new gear units achieve very high thermal ratings as result of a new and optimized housing design. 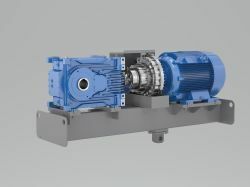 Together with the increased surface design and optimized fan design, MAXXDRIVE XT gear units are ideal for continuous industrial conveying and bulk material handling applications. In many cases, additional cooling is not required. The new generation of IGUs supplement NORD’s application-optimized right angle gear units, and is especially suitable for conveyor belt systems. The optimized housing geometry achieves maximum thermal ratings and effective fan cooling through an enhanced fan design and air flow. “NORD’s new MAXXDRIVE XT series is achieving some of the highest thermal ratings in the industry,” says Almoghrabi. He said the MAXXDRIVE line also offers the industry’s largest range of symmetrical designed IGUs. NORD is introducing seven MAXXDRIVE XT sizes with a power range of 67 to 2,000 HP with speed ratios of 6.3 to 22.4. Output torque ranges from 132,000 to 660,000 lb-in. The power and speed range were specifically designed for industries in which high speed ranges are required in combination with high powers.